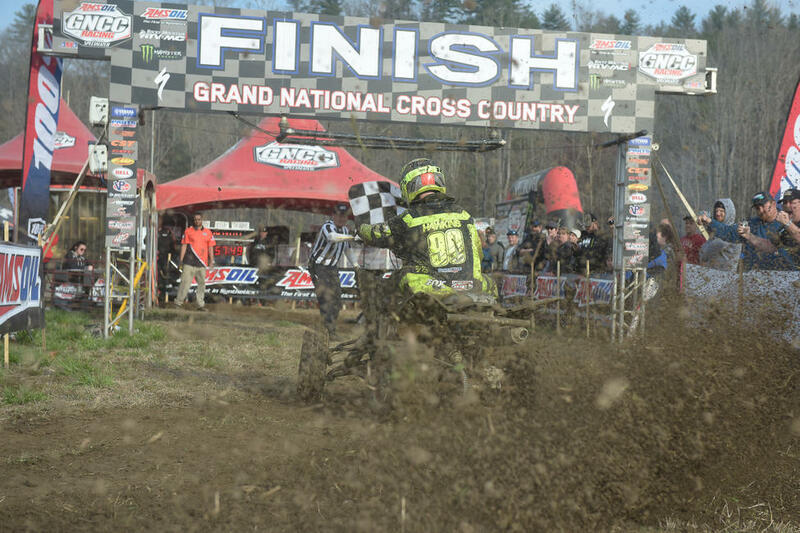 Steele Creek served as round three of the 2019 AMSOIL Grand National Cross Country (GNCC) Series, an AMA National Championship. It took place March 27 and 28 at the Steele Creek Park and Family Campground. This race is also known for elevation change, with long uphill and downhill sections. In short, it has plenty of elements that make it a traditional-style off road race. The Youth ATV course at Steele Creek clocked in at approximately 3.7 miles, while the micro course was 1.6 miles. Ground conditions were near perfect for both races, with only a few slick spots out on the course. Unlike the micros, the youth riders did have to face the bridges and creek crossings, which did get pretty muddy. 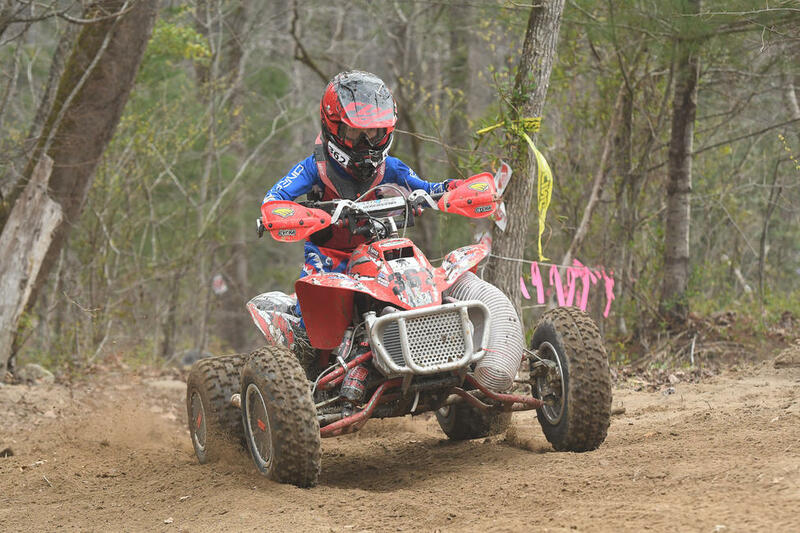 Of the 69 Youth ATV riders at Steele Creek, Damien Hawkins was the overall winner, while Garrett Cox came out on top of the 31 Micro ATV riders. Steele Creek marks Charlie Stewart’s third win in a row, as well as his highest overall finish this season – 6th place. Stewart started out last off the start, but steadily made his way into the lead. By the end of lap three he had a minute and a half lead that stayed consistent throughout the rest of the race. On the other hand, Nicholas Dearing, Tyler Cox and Heath Randolph stayed in a tight pack for the last half race, swapping positions many times and were never separated by more than a handful of seconds. They finished in the order listed above, with Randolph missing the podium by just over a second. When asked about his race, he said “There’s nowhere to pass, and going into the woods almost last meant I had some work to do. So I put my head down and rode hard. 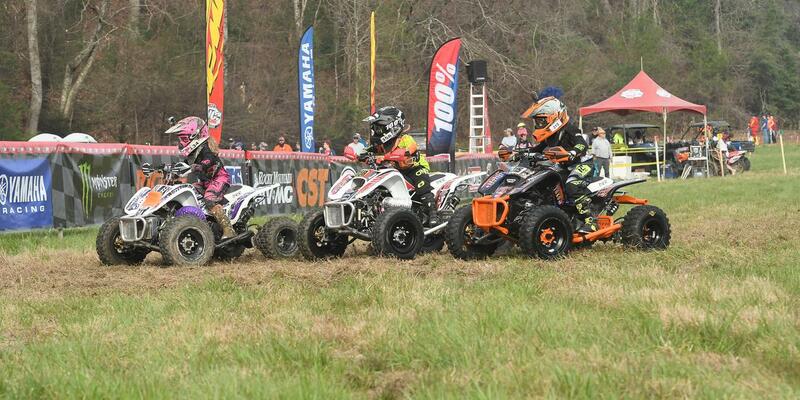 The overall non-YXC rider in the ATV youth race was Caden Spires (YAM) from Russellville, IN. 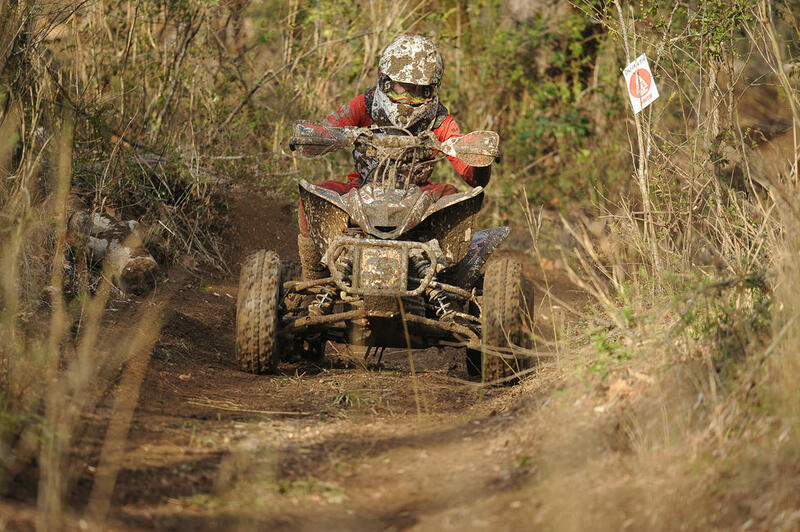 He competed in the 125 SR. (8-11) ATV class and finished 12th overall. Garrett Cox won his first Micro ATV overall and MXC1 win for the season at round three. Since Bodie Buckhannon finished second this round, it puts these two riders in a numerical tie in the series points standings. It was a close and exciting race; in the end Cox only edged out Buckhannon by four-tenths of a second! At his first GNCC this season, Kaleb Shay rounded out the MXC1 podium with a third-place finish. In the MXC2 ATV class, the racing was also very tight. Tyler McLaughlin came out less than half a second ahead of Khyler Davis, taking the win and a third-place overall. The two of them exchanged the lead at least three times during the race that I know of, and probably more! Colton Tennant was also close to the leaders – eight seconds down from Davis when the checkered flag waved, to be precise. However, he was unable to make any passes and rode in third place for the majority of the race. The overall non-MXC rider in the Micro ATV race was again Ryder McCormick (HON), racing in the 90 Stock (8-11) class. He placed 6th overall here at Steele Creek. 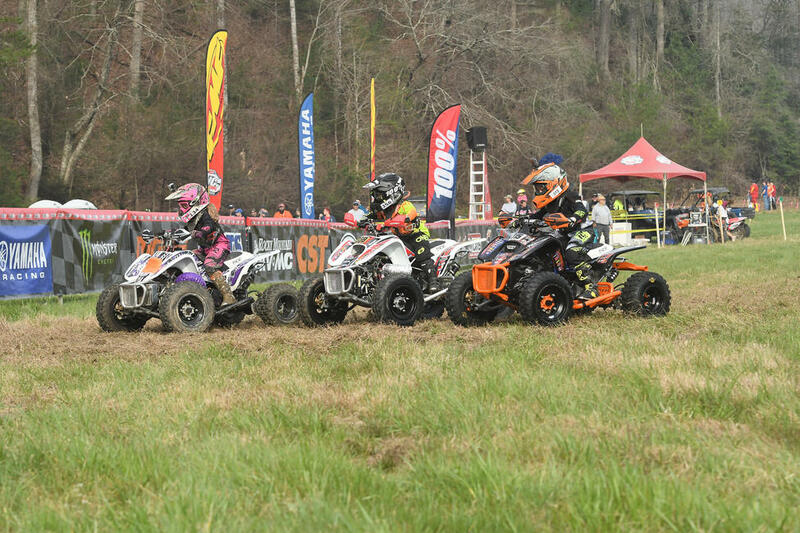 The next round of the 2019 AMSOIL Grand National Cross Country Series will take place this weekend, April 13 and 14 in Society Hills, South Carolina with the Camp Coker Bullet GNCC. ATV and Micro racing will take place on Saturday while Bike racing will take place on Sunday. The AMSOIL Grand National Cross Country Series (“GNCC”) is America's premier off-road racing series, featuring motorcycles, ATVs and Side-by-Sides, for men, women and children of all ages. Founded in 1975, the 13-round championship is produced exclusively by Racer Productions. Cross-country racing is one of the most physically demanding sports in the world. The grueling three-hour GNCC races lead as many as 2,400 riders through trails ranging in length from 8 to 12 miles. With varied terrain, including hills, woods, mud, dirt, rocks and motocross sections, GNCC events are tests of both survival and speed, drawing talent from all over the United States, Central America, South America, Europe, Japan, Australia and New Zealand. GNCC Racing is televised on NBC Sports and RacerTV.com. For more information, visit www.gnccracing.com.